Oil feed and oil drain line. 5. Attach a filter at the end of your maf sensor, and attach the sensor onto the inlet of the turbo. Make sure the maf sensor is atleast 12inches away from the turbo inlet. 6. Mount your intercooler, and attach the piping from the turbo to the inter cooler and then to the intake manifold. You have to install your bov anywhere along the intercooler piping. 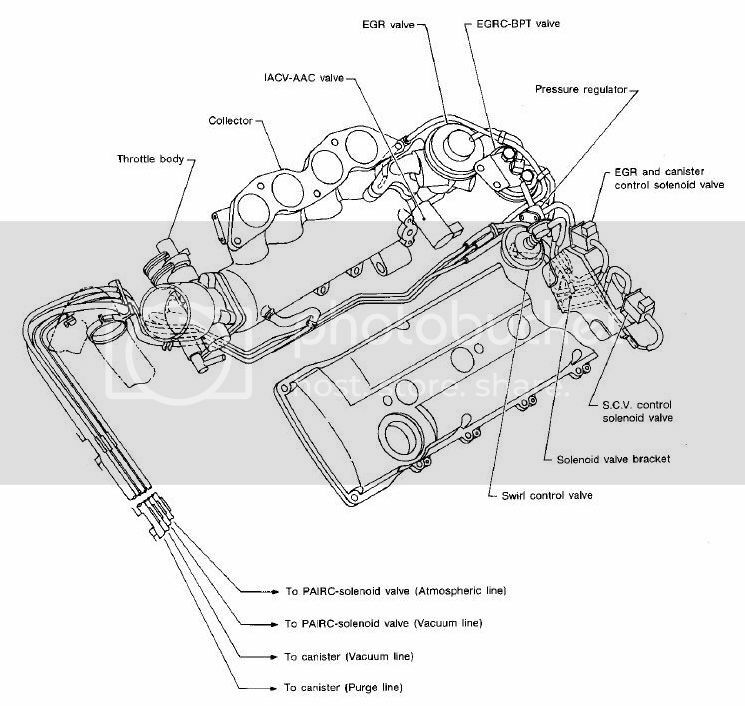 Attach the vacuum hose from the bov to a vac source (diagram at the bottom). 7. Tee off your stock oil pressure sender and attach your oil feed line to the tee, and the other end to the turbo feed port. 8. Weld a bung onto your oil pan, and attach the oil drain line from your turbo oil drain port to the bung on your oil pan. 5. Attach a filter at the end of your Z32 maf sensor, and attach the sensor onto the inlet of the turbo. Make sure the maf sensor is atleast 12inches away from the turbo inlet. 6. Mount your intercooler, and attach the piping from the turbo to the inter cooler and then to the intake manifold. You have to install your bov anywhere along the intercooler piping. 14. If you have a tuned ecu from enthalpy or JWT, install it. Otherwise, you will need to tune your car. You might also want to consider having an oil pressure gauge and boost gauge installed as well. If you are looking to get more out of your car, you will have to build your bottom end to be able to handle the beating. Bottom end includes: Pistons, Piston Rings, Rods, Bearings, Head Gasket, Head Studs. When starting a turbo project, just remember that the results will always have a direct correlation with the amount of work and money you put in. Expect to have at least 2000$ set aside for this project, if not more. You will have many hiccups, and there will be many frustrating road blocks, but don’t give up on the build. The KEY to a reliable car, is the TUNE! I cannot stress this enough. People always ask, “do I have to tune the car, or can I just get an safc?” Believe me, the safc route is not going to allow your motor to be reliable. A rom tune only costs about 300$, so don’t blow your motor up over the 150$ extra that you could’ve dished out for a great tune. You need QUALITY parts for your build to be reliable. 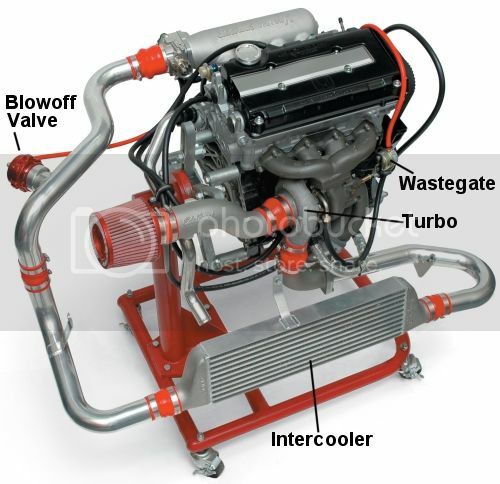 The three key parts that you need to be most reliable are your wastegate, turbo, and blow off valve. *Feel free to give your input. Last edited by shift_down on Thu Sep 06, 2012 12:40 pm, edited 2 times in total. thanks! i got tired of seeing the same questions every day. We have a problem here... This engine isn't facing the correct way. It's a sidewinder. lol what engine is that exactly? by the way this information was available at one point on this forum, I'm surprised you didn't see it. Not sure what motor that is. I found it a long time ago when I was learning about turbochargers. It is a B series. Yeah, thta is the Edelbrock turbo kit for a Honda B series. Great info though. Man this is AWESOME! Good job! Ill link any n00b to it from now on! I think that could be sticky material right there. the old turbo for dummies is getting atad dated, this is all that plus a bunch of good info. Stickied. If you need to add more info, let me know and I can add after the first post so information is at the beginning. nice! this is a very good post! although its top level, this would have been awesome to stumble across when i was starting. the step by steps are comforting for someone who has not one ***** clue like we all did when we started with cars. this is a real silly comment but i think T'ing off the sender for oil is pretty weak sauce, they often crack years later. an oil sandwich is another option thats under $40. and finally the best option is to drill n tap the dummy plug on the stock oil neck and buy a $10 fitting. this gives you filtered oil to your turbo too. sdaigle240 wrote: this is a real silly comment but i think T'ing off the sender for oil is pretty weak sauce, they often crack years later. an oil sandwich is another option thats under $40. and finally the best option is to drill n tap the dummy plug on the stock oil neck and buy a $10 fitting. this gives you filtered oil to your turbo too. I personally prefer the sandwich plate also, that's the way I went with my build. This is nice to have stickied, i agree the turbo for dummies thread was a bit dated and confusing.. thanks! I drilled and tapped my oil filter block for extra ports. A sandwich plate is good if you want to run a cooler etc. But otherwise its just another part that can leak. So for the 300rwhp range it's not recommended to rebuild bottom end with forged pistons/rods? The other KA24DE-T for dummies thread mentions that at 300+ you want to consider upgrading to forged pistons at least, as they're the weakest link in the KA24DE. The reason I ask is because A) I'm a noob and B) I'm pricing out parts to turbo my KA with a 300rwhp goal. I'm looking for reliability here, so if it's highly recommended to add forged pistons/rods to maintain reliability, I'd definitely be leaning in that direction. I plan on going with a JWT ecu. Qemyst wrote: So for the 300rwhp range it's not recommended to rebuild bottom end with forged pistons/rods? Do it right the first time or pay more for it later on. Point, blank, period. Kruked wrote: Do it right the first time or pay more for it later on. Point, blank, period. Yes. That's the plan. Hence the focus on reliability and doing it right the first time. My question stands. Is it unnecessary to upgrade to forged pistons/rods for 300hp with a JWT tuned ecu and will it be reliable? If it will NOT be reliable, i'll gladly add forged pistons/rods and any other necessary supporting mods because i'm not messing around, lol. I'm adding a turbo and I don't do anything half assed. EDIT: The only reason I ask is because the "things you will NEED" part of the ~300-350hp section doesn't mention building up the bottom end. Below that section, as though separated, says if you want to take it any FURTHER (ie. going above 350hp), you will need to rebuild the bottom end. I ask because I could be reading it wrong, and the mention of rebuilding the bottom end IS intended for the ~300-350hp range and it's just formatted in a way that I misinterpreted. I mean, there's doing it right the first time, but how right is TOO right for my 300hp goals? Forged Pistons/rods are a good 800 bucks more on top of an already pricey project. If 300hp w/ a JWT tuned ecu is going to be reliable, then I'd rather not dump an extra 800 bucks into the pistons/rods and then even more into having the cylinders honed. If forged pistons/rods ARE necessary to make 300hp reliable, then so be it. I'll spend it. It's like.. If I need to load something onto a truck, and wooden planks will be perfectly strong to use as an incline plane and no problems should arise from using them, I should use them. Then one could argue that I should use steel beams for added strength, weld more supports to the bottom of the beams for EVEN MORE strength, etc. Neither way is WRONG, but one is complete overkill. You can easily make 300hp reliably on that set up, no problem; as long as you have the tune to support it. Before turboing your motor, do a compression check. If you get a similar psi between 170-210, then you are good to go. I say 170-210 becaus i don't know if you decked the block head. Also, as long as your clearances are within spec, bearings should be fine. What else do I need to complete my kit? Im slowly gathering stuff for my ka-t. I plan on running about 6psi on stock bottom end with about 20k on the rebuild. What kind of power gain can I expect? 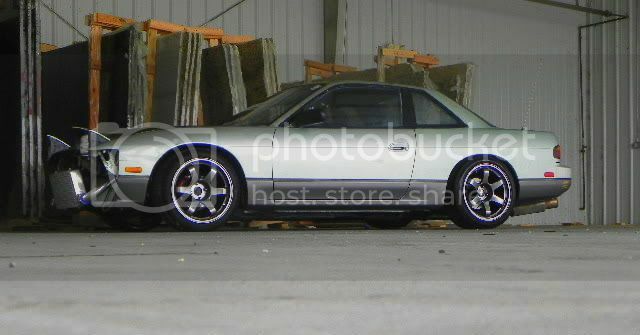 Also the ecu is for an s13 but I have a 98, where can I find an adapter plug?